Please help yourself to our logo. You could consider adding it to your website or blog, and making a link back to this Kia Eke Panuku website (https://www.kep.org.nz). To download the logo, click on one of the following links to open the image, then right click the image so you can download and save it to your computer. You might like to entitle the file you save as the Kia Eke Panuku logo. Please feel free to download, print and distribute this Kia Eke Panuku poster for your staff, students and community. This is a PDF of the presentation by Associate Professor Mere Berryman at the Kāhui Whakaako Hui in September 2016. It utilises Dr Ann Milne’s “Colouring in the white spaces” scholarship in education as a lens to better understand the context in which we are working in New Zealand’s English medium schools. The presentation challenges us to think about the imperatives that underpin our work; the moral imperative (Treaty of Waitangi), the political imperative (Ka Hikitia) and the social imperative (ERO’s Evaluation Framework). Finally, it lists the ways in which this work must be undertaken. This is an A4 chart that provides a model to provoke discussion around the comprehensive approach taken to the mahi associated with each of the Kia Eke Panuku discussions. For an explanation of the theorising behind this chart, go to Mahi Tahi - Making the Difference. Kia Eke Panuku schools have developed a number of Resource Kete in order to share their experiences. The video kete include question frameworks to support considering the implications for our own practice. These focusing questions link to, and contextualise, other Kia Eke Panuku resources. The Literacy Network Kete contains materials designed for classroom use. These resources have been developed to support schools to activate their response to the themes detailed in Student Voice. This series of iBooks was initially developed for use by Te Kotahitanga facilitators in the field. We have reformatted a number of these as web pages (eBooks). They retain the features of the original publication, for example, the original page numbers and the resources within them are included to download. On this website, each eBook is available for online viewing (which allows you to view the videos within it) and also as a downloadable PDF. This is an A3 one-page chart used to determine the model of individualised professional development in each participating school known as the Intensity Tool. This is an A4 multi-page document for use in the development of Culturally Responsive and Relational Pedagogy. This is an A4 multi-page document detailing the use of the Classroom Observation Tool. This is a tool which has been developed to assist schools to track the activation of the Critical Cycle of Learning as they engage in Mahi Tahi. This is a tool that provides a way of tracking progress across the Kia Eke Panuku Dimensions in relation to GPILSEO, a model for sustaining reform. This is a graphic organiser which has been contributed by Kerikeri High School. These PDFs originate from the Ngā Huatau Taiohi collection of this website. 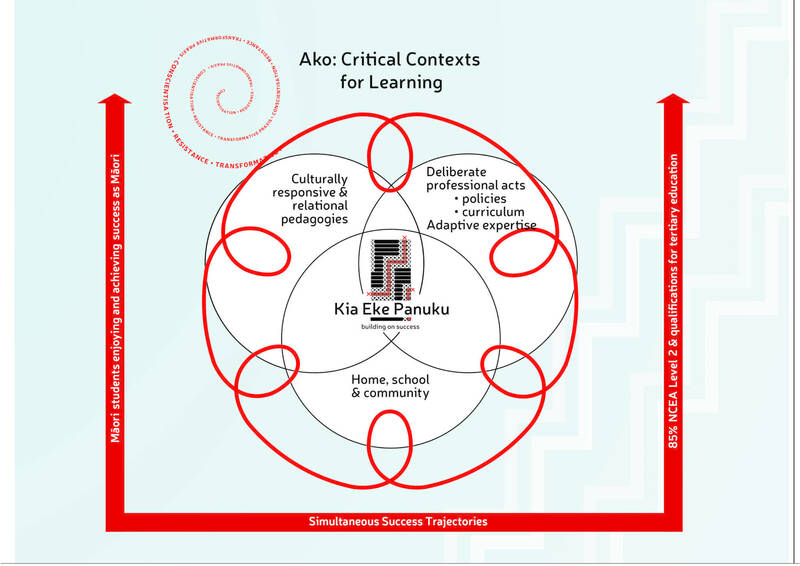 This is a one-page chart showing the institutions created through participation in Kia Eke Panuku with the simultaneous success trajectories for Maori achieving as Maori (Ka Hikitia) and tracking towards the BPS goals. This is an A4 PDF document explaining the Mahi Tahi model and how schools might better understand the Voices series. These are 16x A5 PDF documents, written by the Kia Eke Panuku Team Academic Directors and Kaitoro, reflecting their understanding and experience of the Kia Eke Panuku institutions, listed in the order they appear on the Mahi Tahi framework. This is the introductory Kia Eke Panuku booklet with the vision, the kaupapa, links to Kaupapa Māori and critical theories and their inter-relationships. This is an A3 chart of the relationships and interactions that characterise the Kia Eke Panuku response. This is an A3 one-page chart of the Ako: Critical Cycle of Learning (unlearning, relearning). This is an A4 folding document that highlights the elements within Culturally Responsive and Relational Pedagogy. This is a set of six A5 folded brochures that highlight the interdependent dimensions that schools apply to close the gap between Māori and non-Māori achievement. This is a 'straw man' A5 card developed by the Expert Advisory Panel to initiate discussion around what does Māori enjoying and achieving education success as Māori look like and feel like. This is an A4 chart that illustrates the challenge set Strategic Change Leadership Teams and their relationship to other stakeholders.